The Cave Rabbit’s (or is it Mr. Cottonbottom’s?) explanation of the universe to jefbot continues! Thanks for indulging me this trippy journey through Life, the BOTiverse and Everything (we’re not quite done yet!) – I’ve been having a ton of fun drawing these strips, and the info conveyed will be important to bot down the line. And of course, everything said in today’s strip doesn’t preclude the possibility that the universe is a platypus or anything you BOTreaders theorized in the previous strip. heh. yep! and we aren’t even fully through the rabbit hole yet, f_f! Wow it is trippy but good I like the cave bunny’s explanation. The colors are beautiful! thanks, Kris! glad you’re diggin’ the trippy artwork. Yay thank you they’re like contacts. also holy crap Pokemon XY looks AMAZING. stuff got leaked but they look awesome. seriously looking forward to this game. thanks for the jaw drop, dj! and, yeah – can’t wait for XY!!! tried not to look at the leaked stuff but couldn’t help it. which one you gettin’? looks like X for me now. Starting with Froakie and Bulbasaur. yeah, i love the way yveltal looks but a friend’s getting Y and xerneas reminds me of the forest spirit in princess mononoke so that’s the one i’m goin’ for. plus i love the letter x.
Oh my God, it’s full of stars! And apparently a pair of Gumbys. heheh. maybe they’ll meet the star child on this journey, Jim? Just waking up makes jefbot strips even trippier. After the recent strips: I feel like some parasite living off one of a billion trilliion sum’n sum’n gabajiliinion cells from an ever expanding platypus. And Giant Cave Rabbit Tea makes you very high. i sometimes feel that way, too, ROM! let’s just hope if the universe is an organism that we aren’t some sort of cancer corrupting one of its cells. ooh, yeah – reading JEFbot (especially the recent strips) while still in a sleepy haze is the optimal way to absorb the strips, ROM! It’s too early for existential concept. Where’d I leave my coffee? I thought this strip finally broke me for a while. i can’t wait to boldly go, JGT! now i have the “Great Space Coaster” song in my head, Graypatch. she was right about a great many things, Sarah W! and thanks for the art kudos – this style takes a lot more time so i’m glad you’re diggin’ it! I swear, the Cave Bunny is growing in size by the nanosecond. And there’s something beyond awesome about seeing Jefbot sitting on his shoulder. 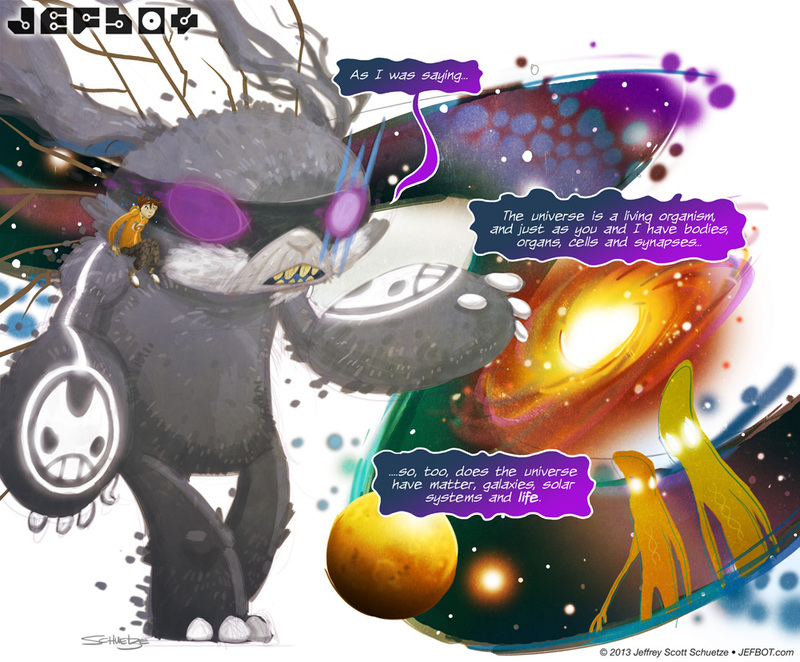 I love the Cave Bunny’s explanation of the universe, along with the artwork—as always. jefbot sitting on the Cave Bunny’s shoulder is one of my fave images from this sequence so far, Blunz, so i’m happy you’re diggin’ it, too! It’d be hilarious if Cave Bunny grew his own tea, and just their proximity to the Hollywood sign is what made it hallucinogenic. also, you’re right that it’s still possible the BOTiverse is a platypus! keep the hope alive. I’m still waiting where you want to take us with this but I’m feeling like first time I watched 2001: Space Odyssey and we got to the scene after entering the monolith. It took me years and reading the original book to figure out what was going on after that LSD scene. thanks, JR! i dig the lil’ bot, too. heheh. Oh shoot I forgot to make a comment! Uh, what to say what to say…..
Well, it feels as though you’re trying to branch out and expand your drawing skills by making the comics during this trip not in the comics usual style. It also makes me want to start playing “Lucy in the Sky with Diamonds” or any other Beatles song from that time period. i’m definitely exercising different drawing muscles with this storyline, which i’ve found makes my artwork better overall. i remember when i started stretching a bit with the “Super Scrawn/There Will be Scarf” storyline, and after that, the “regular” strips felt so much easier to draw. So…’bot, I gotta ask. Did you ever read God’s Debris by Scott “Dilbert” Adams? Because this model of the universe feels a little familiar (not that I’m saying God’s Debris was the origin of it…I’m sure it’s an idea that goes way back). Wow. These last few strips look beautiful. Great job.